Giles d’Argentine is a rather enigmatic figure of the Battle of Bannockburn. His parentage is problematic, and his exact lineage cannot be proven. In 1302 he was named as one of twenty who broke into the house of Peter De Dene and consumed and appropriated his goods. He then deserted from a military campaign in Scotland to compete in a jousting tournament at Byfleet in Surrey, for which King Edward I issued an order for his arrest. Yet his skills as a knight were beyond reproach. In 1304 Edward I released him to fight at the siege of Stirling Castle, where he earned himself a pardon. However, Giles had not learned any lesson and deserted, along with more than twenty others, from the 1306 Scottish campaign. By now probably furious, Edward I again issued a writ for his arrest. Unsurprisingly he is recorded as being known to Robert the Bruce at court before 1306. Events came to the aid of Giles on the death of Edward I in 1307 – by March 1308 Edward II had appointed him as constable of Cambridge Castle. However, Giles retained his love of competition appearing at the Stepney Tournament on 28th February 1308. In pursuit of his career as a knight he went on Crusade to Palestine, where he is credited with slaying their chief warriors on the three occasions he encountered Saracens. He was also in the service of Henry VII of Luxembourg, Emperor of Germany allegedly the bravest warrior of his time, followed by Robert Bruce and thirdly Giles d’Argentine himself. Unfortunately Giles was captured near Rhodes. 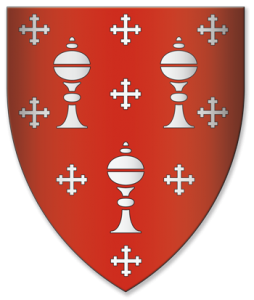 Events back home especially in Scotland (1313) again helped Giles escape prison, as Edward II, knowing he needed his best knights, sent a request to “aid in procuring the release of Giles de Argenteyn, knight”. By March 1314 Giles was back in England in time to join the King at Bannockburn as his personal bodyguard. On seeing the inevitable defeat of Edward II’s army Giles ensured his king was safe and, unable to honourably depart, turned to the Battle and was slain. Giles was lamented by all, even his enemy Bruce who ensured a suitably honourable burial at St Patricks in Edinburgh.